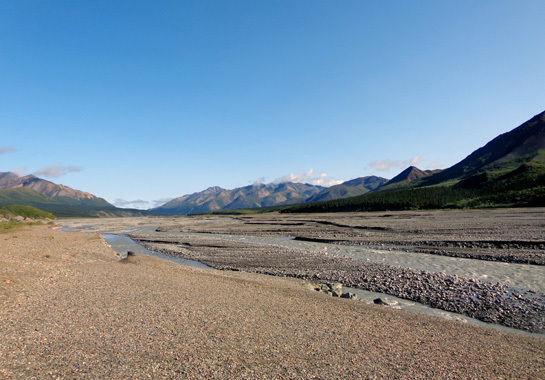 "The Toklat valley offers excellent opportunities for hiking and wildlife viewing. 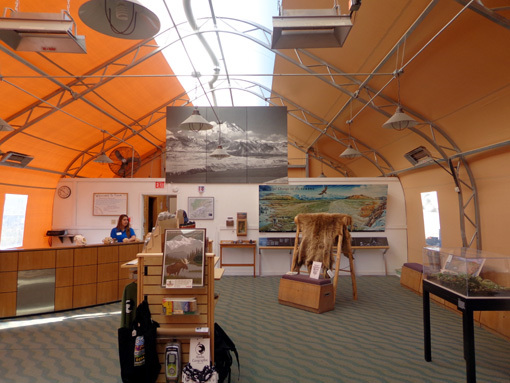 peruse the exhibits, and check out the Alaska Geographic bookstore." 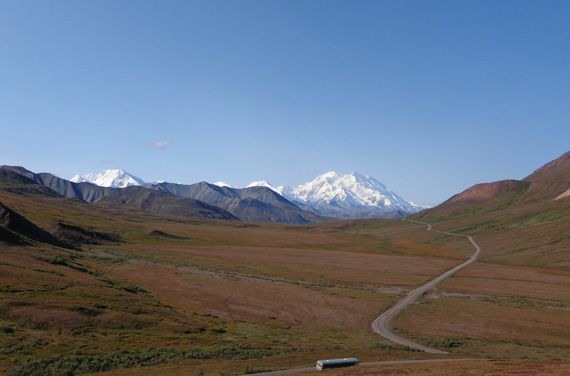 Continued from the last entry, which covered Miles 29 to 53 on the Denali National Park road on our first shuttle bus trip into the backcountry. 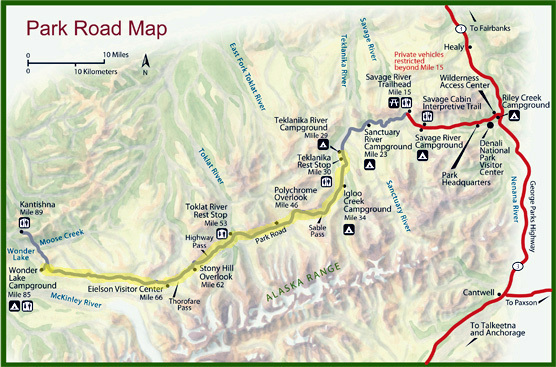 We're approaching the Toklat (TOW-klat) River rest area and ranger station, which also includes some exhibits and a bookstore in a Quonset hut-type building. There are a bunch of restrooms at the other end of the large parking area. 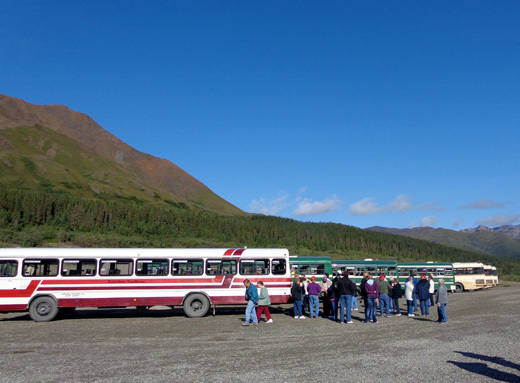 Most tour and shuttle buses stop here outbound and/or inbound to give passengers a break for about 10-20 minutes. 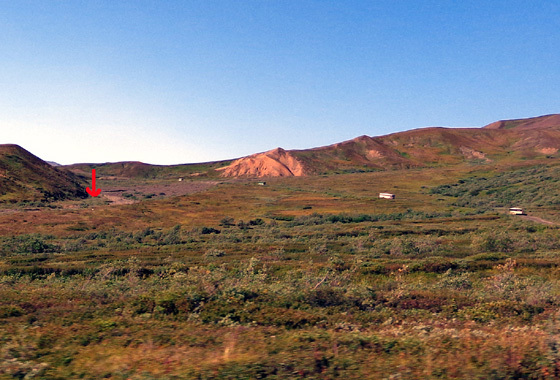 This red mountain near the Toklat River rest area is very photogenic. 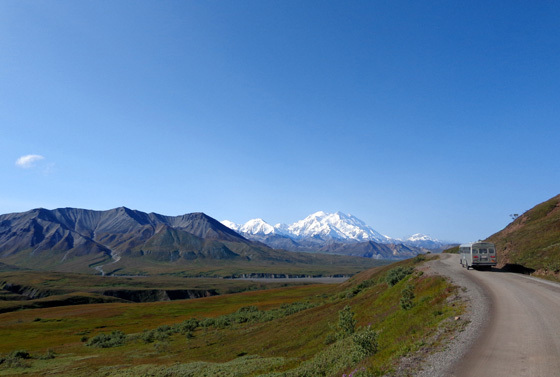 We got another peek at Denali across the wide river bar as we approached the Toklat rest area. 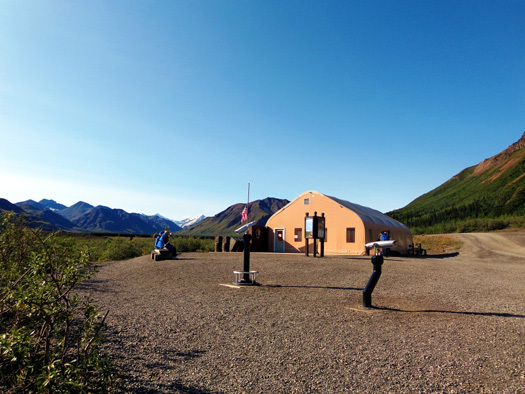 the Kantishna Roadhouse, a private lodge at Mile 92. Green = shuttle buses, tan = tour buses. 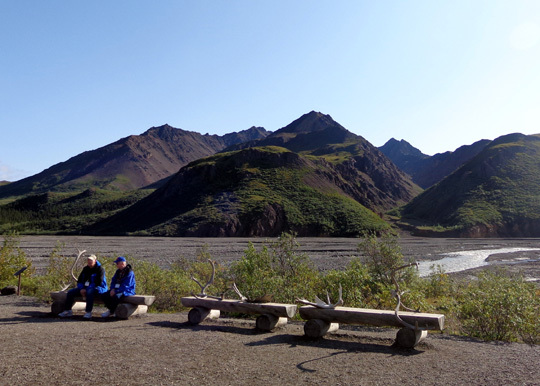 There are some spotting scopes and benches outside the main building at Toklat River. 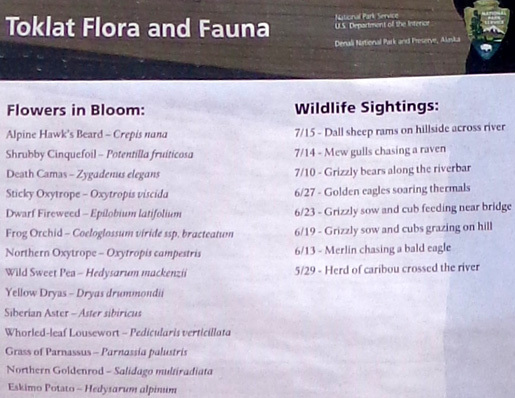 As noted in the quote at the beginning of this entry, one of the interpretive panels at this rest stop encourages people to explore the riverbed and surrounding terrain in search of wildlife and different views. 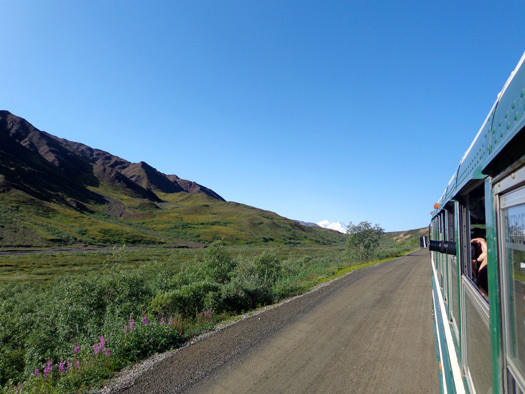 After about 15 minutes our bus continued west toward the Eielson Visitor Center. To everyone's delight, we'd have some excitement along the way . 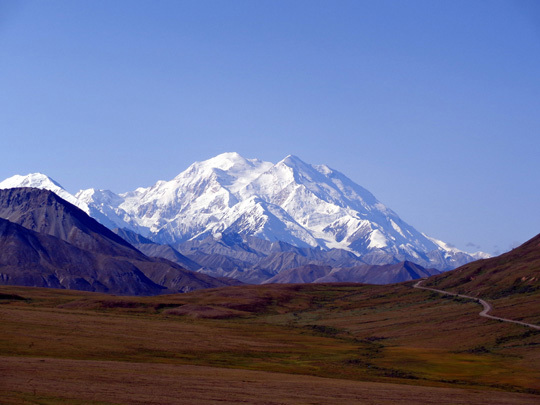 . .
Not only did we get some of the best views of Denali today that have ever been seen by visitors, we also saw enough critters to feel like we more than got our money�s worth. Jim carried binoculars so we could see the wildlife better than with just our 60+ year old eyes. 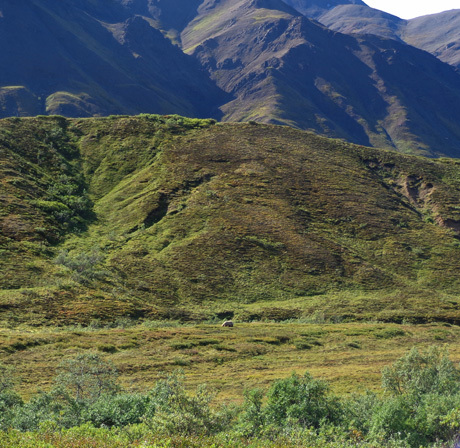 We saw several lone grizzlies this morning, probably all males unless some cubs were not visible in the willows. Two were on the other side of the bus going outbound. 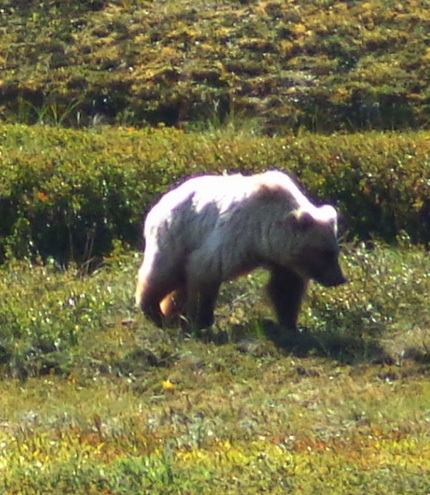 Jim was closer to our neighbors' window so he got pictures of those bears. One is shown on the previous page. 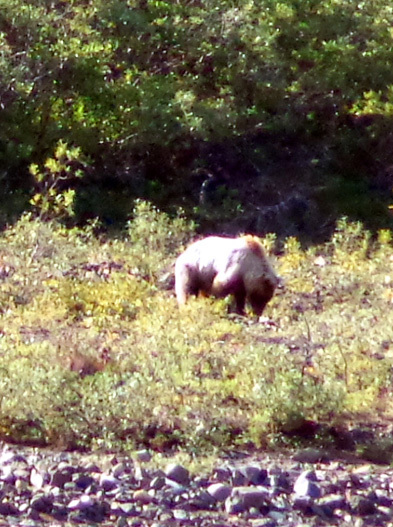 The closest bear we saw today was about 200 feet away at the nearest point to our bus. That one was on my side so it was much easier for me to photograph. 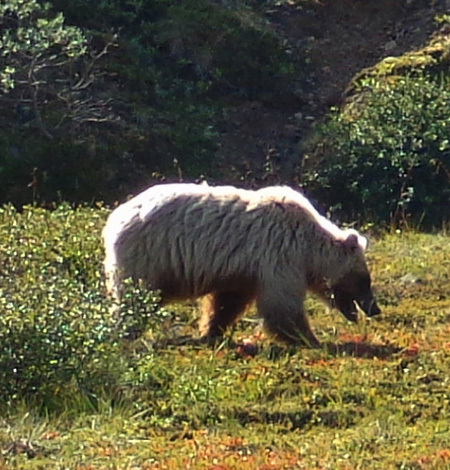 Before day's end we also saw a caribou, several Dall sheep, and two wolves in the wild. More about those on the next three pages. It is moments like these that I get a bit of camera envy. Folks with those long zoom lenses can probably see the individual whiskers on that fella's snout! When I purchased my compact 16-megapixel Sony Cyber Shot digital camera Jim encouraged me to get an SLR with interchangeable lenses instead. 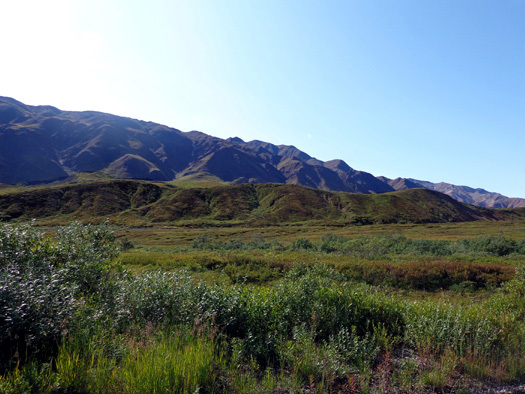 I should have listened, rather than trying to be economical and "practical" -- it's so much easier to carry and use a compact camera, and this one does reasonably well with landscape photos. I've got plenty of capacity with 16 megapixels. 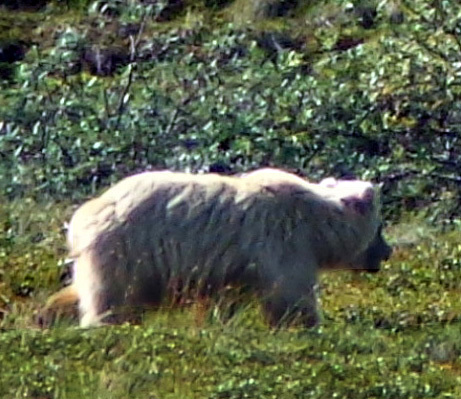 The main thing I'm lacking is the ability to zoom in closely to subjects like this bear that are far away. 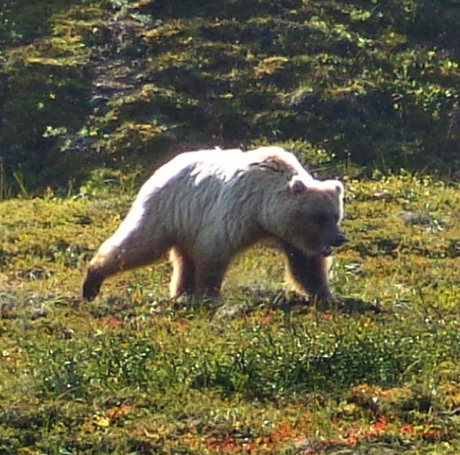 My Sony has more zoom than many compact cameras (16x optical) but that's a far cry from powerful 400mm lenses! I mostly don't want to take the time to research the plethora of SLR options and learn how to use the doggone things. I had lots of fun with a Nikon SLR and several kinds of lenses and fiilters back in the 1970s but I've forgotten most everything I once knew about f-stops and exposures and all that. I don't even know how much of that is relevant with today's digital SLRs. 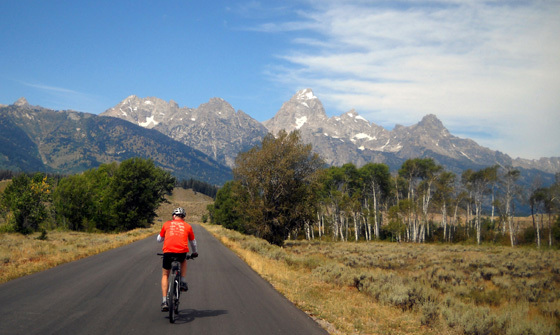 I've tried to simplify my life since I retired. I'm not sure I want to get a complicated camera and accessories even if it means I can get much better pictures of far-off subjects than I do with compact cameras. Heck, I'm too lazy to learn all the settings on the much simpler camera I'm currently using! 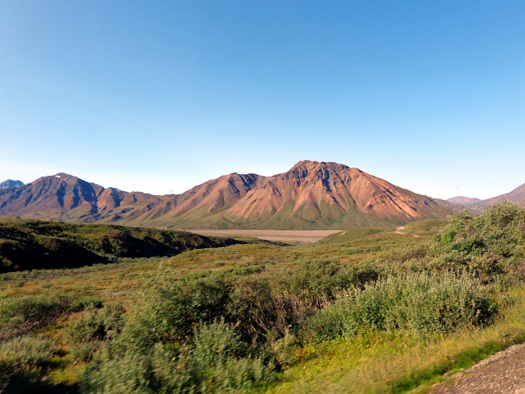 <sigh> We'll see if I get a Big Girl camera for our next Alaska trip . . .
Jim's trying to talk me into buying one when we get back to Anchorage, not a year or two from now. I suggested he get himself one but he doesn't enjoy photography nearly as much as I do. He rarely uses the older Canon 12-megapixel compact that he likes, and he even more rarely uses the Sony because it doesn't have a viewfinder. 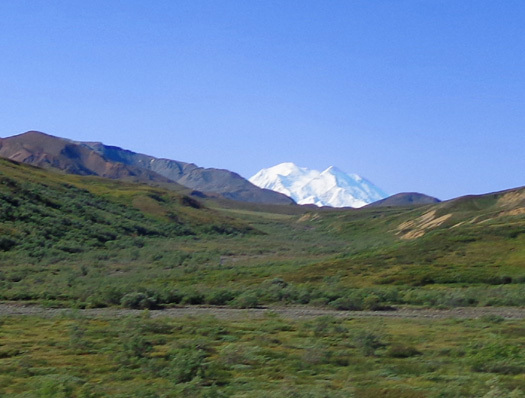 SO WHO NEEDS A FANCY SLR . . .
. . . when I was able to get shots of Denali like this from Stony Hill and later at Eielson with my puny little compact camera???? Those photos are simply spectacular at full resolution, especially the close-up. It's probably my favorite picture I've taken in my whole life. I plan to use it as the header for all my 2013 website entries. 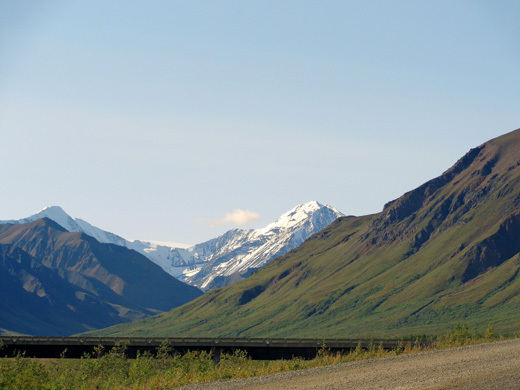 That view alone from Stony Hill was more than worth what we spent on our bus tickets, and we were even closer to the mountain a few minutes later when we got to the Eielson Visitor Center and along the road to Wonder Lake. 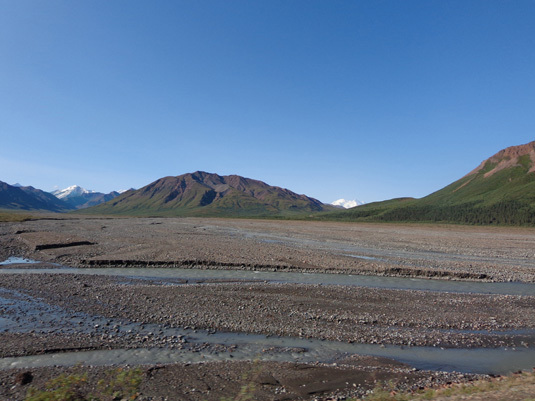 Stay tuned for more photos from Eielson, the most popular tourist destination along the park road in Denali's backcountry.